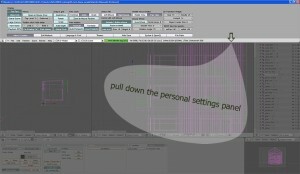 Grab with the mouse the bottom of the main Blender menu bar located at the top and pull it down: the secret panel is revealed! the MMB options are under the “view & controls” tab. You’ll find several other settings to try out. You will probably want to save the new settings: File->Save default settings . Caution: this saves not only the general settings but everything in your Blender at that time, including geometry, windows and open toolboxes, so for a clean “new” file you should arrange things the way you like, keeping the initial blender cube or not, then save the settings.